The humble rubber grommet is one of the most important components of any doorbell with tone-bars. When one or more of the notes sounds flat, muffled or tinny, deterioriated grommets are usually to blame. The two chimes pictured at left are of identical age and construction. 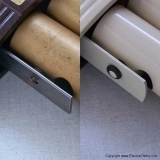 The chime on the left side of the photo has a missing rubber grommet. The grommets used on most early chimes were made of natural rubber hardens, cracks and crumbles after many decades on the wall. Sometimes the grommet disintegrates entirely, and the tone bar becomes so loose it no longer retains the solenoid plunger. In severe cases, the entire tone-bar is lost. The grommets retain the tone-bars in a vertical or horizontal position firmly enough so they do not fall to the floor, yet loose enough to allow for the free vibration necessary to produce sound. When a tone-bar is struck in the center, it vibrates in such a way that, some distance from each end, there are points where the metal remains practically stationery. It is at these points where holes are drilled in the tone bars for the grommets. Fortunately, replacing worn grommets is a relatively intuitive affair. 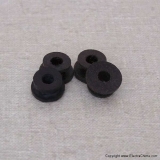 Most any well stocked hardware store carries grommets in a variety of sizes.